These Thai noodles don't have a drop of alcohol in them. There are a few theories as to how they get their name—one being because they are perfect when accompanied by an ice cold beer. Also called Pad Kee Mow, they happen to make a great hangover cure. 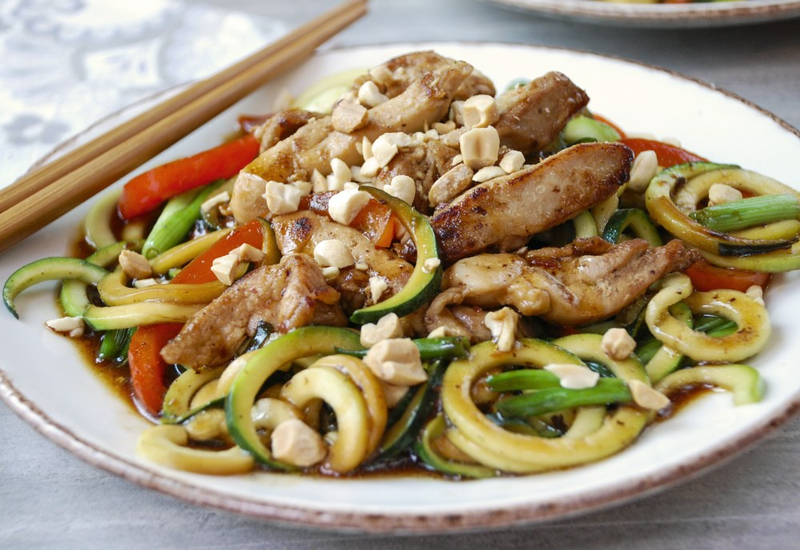 This low-carb version is lightened up by using zucchini noodles instead of the traditional rice noodles, and coated in a sweet-sour sauce with marinated chicken thighs. Chili-garlic sauce adds the heat in this recipe; add more if you like it extra-hot. Top with crushed peanuts for crunch, and torn Thai basil leaves if you can find them. If you'd like to make this dish vegetarian, substitute 1 pound firm tofu cut into cubes for the chicken thighs. Gluten free? Omit the soy sauce and use a total of 4 tablespoons tamari instead. The chicken can be cooked ahead of time and reheated; assemble the rest of the dish just before serving. Per Serving: 357 calories; 20g fat; 13.7g carbohydrates; 33g protein; 138mg cholesterol; 1568mg sodium. These noodles were so good! I added mushrooms in addition to using zucchini and bell peppers like the recipe calls for. It tasted very authentic and better than take-out! These drunken noodles are fantastic! The tamari sauce is perfect for this dish. If you're looking for a guilt free way to enjoy Chinese food without all the carbs, this is it. I definitely plan to add this to my weeknight rotation. The chili-garlic sauce and bell peppers are really what gives this dish that extra something special!